Rudolph the reindeer probably was not bullied for his crimson snout - because he and his fellow reindeer cannot see red. In news that may come as a shock in the North Pole, University of Exeter scientists have revealed that Santa's sleigh-pullers are missing the colour-detecting eye cells that allows humans use to detect red. The same applies to orange - meaning Donner, Blitzen and the rest also might struggle to spot any tasty carrots left out for them at Christmas. 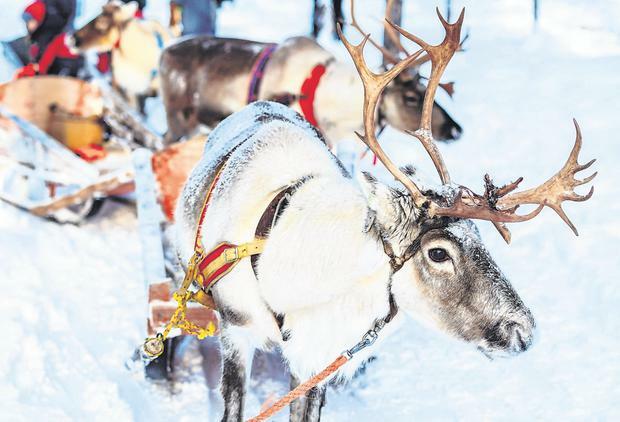 "Reindeer can't see red light or tell the difference between red, orange and green," explained Professor Martin Stevens, of the University of Exeter. "So they wouldn't be able to see the red of Rudolph's nose or the orange of carrots. "However, they do have ultraviolet vision, and use this to see lichen hidden in the snow in the Arctic, and potentially even spot white wolves or other predators because fur absorbs UV light whereas snow reflects UV light. "So a camouflaged white wolf to us would stand out to reindeer." Apart from the UV vision, reindeer eyesight is a little like that of dogs, which are also unable to tell the difference between red, orange and green. Prof Stevens and his colleagues' work on animal vision also includes horses, leading to a trial of new colours on fences at racecourses.